In this digital farming age, two hours of downtime is not acceptable, especially when an issue can be fixed with a simple push of a button. AgriSync helps precision specialists deliver better, faster support to their farmer customers and minimize downtime in the field. 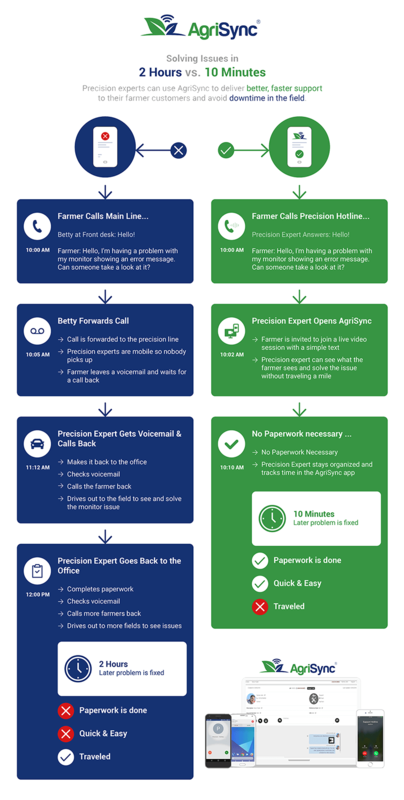 Advisors, you can say goodbye to voicemail, add value to your service plan, and automatically track your time - no paperwork necessary. If you're already using AgriSync, be sure to enable VoiceHub™ and bulk share your hotline number so your customers can quickly access your support team without getting lost in voicemail.